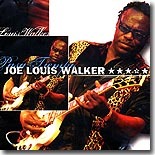 Joe Louis Walker has never allowed himself to be put into one specific musical "box." He shows it with his newest album, Pasa Tiempo. We've got two reviews of it in the Pick Hit section. Junior Watson never surprises his fans with his guitar prowess, but just wait until you hear him sing on his latest, If I Had A Genie. It's this month's Surprise pick. New Orleans piano player James Booker was always described as "eclectic." With so few recordings of this master of the 88s, it's great to see someone digging out lost recordings, like The Lost Paramount Tapes, this month's Flashback feature. This month's What's New section includes new releases from Doyle Bramhall, Lou Pride, Don Nix, Savoy Brown, Hash Brown, Jimmy Thackery, Nick Curran, Smokin' Joe Kubek Band featuring B'Nois King, the excellent Harry Manx, Bill Perry, and more, as well as excellent re-issues from T-Bone Walker, James Carr and Magic Sam.